bind them around your neck, write them on the tablet of your heart." Heheh. 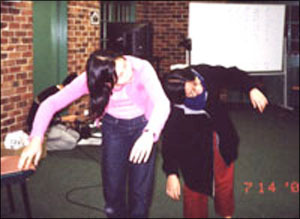 Steph and I as drowned Egyptians in the Red Sea, taken by Valerie during the fantastic major production that was The Abridged Old Testament (I still have the script on a disk some where), at church camp in 2001. Avoiding the camera (Valerie again!) 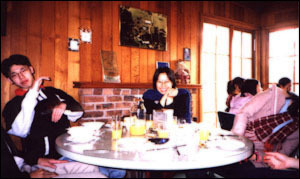 during breakfast one morning at camp in 2001. L to R: Ian, me, Steph. Taken after lunch (at where else? but Nam Viet) by Andrew, a motley group of church friends. 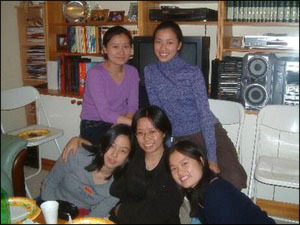 At Dan's 21st (April 2003), a group of girl friends hanging out before the speeches. After EYF one night in May 2003, Ian takes a shot as Dan tells us to imagine if we had just been told that "all your ministries have been in vain!". We then field complaints that we don't look devastated enough; in his defense, Jeff says that he was going for "stunned".